Exclusive 20% Discounts Available -- SIGN UP for a free membership on Garage Commons to access now! Technological and demographic changes in today's global marketplace mean that teams need to have a diverse set of skills in order to stay relevant. 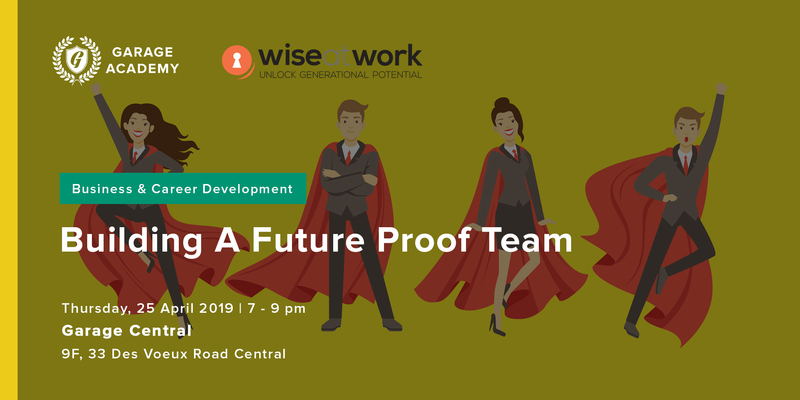 Join Wise At Work and Garage Academy on 26 March to hear from our expert recruitment speaker who will share insights on how some of the largest companies in the world stay competitive by building teams with diverse skills, followed by an interactive workshop to help you understand how to plan and develop teams that drive success. Nerice Gietel is an Executive Coach and Director at “Back to Work Hong Kong”, Hong Kong’s return to work experts. Prior to joining BTWHK, Nerice's career included being an HR Business Partner at a Global Policy consultancy firm and leading a pan-London Domestic and Sexual Violence Advice Service. Her evidence-based work is grounded in postgraduate qualifications in HR Development and Consultancy, Law and Social Sciences. In addition to her coaching practice, Nerice continues to research the Hong Kong labour market and has had articles published widely on this topic: for example on the struggles mothers face getting back to work in “China Daily" and how to return to work after a career break in “Sassy Mama HK”. Priyanka Gothi is the founder and CEO of Wise At Work, till recently known as Retired Not Out. She is an active advocate for age inclusion in the workforce and has been working with organisations and individuals to reinvent and stay resilient in a rapidly ageing world. Prior to this, Priyanka has over 10 years of experience in brand communications and digital marketing for corporates, startups and non profits in India and Europe.